Shane has got a new job as a chauffeur. Shane and Terry hear on the radio that Teryr's husband has escaped from jail. Terry is panicking, saying that her husband will come after her. Shane says he'll take her straight to Des's, and he'll pick up her stuff himself. 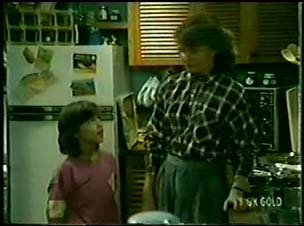 Shane introduces Terry to Des. SHANE: Des, this is Terry, a very good friend of mine. Terry, this is Des, a not so good friend of mine. Shane awkwardly asks Des if he'd like to rent his spare room. Des says that given the state of his finances, he may have to rent his own room and sleep in the garden! Des is a bit surprised at Terry's request to stay, but he suggests a month's trial at $50 a week. Des is surprised that Terry wants to move in without even seeing the room. Shane tells Des that Terry has had a prowler hanging around her flat, so she wants to away for a bit. Des says if there were any prowlers round his house, he'd get Daphne to scare them away(!) so Terry will be safe. Daphne comes in at that moment and is introduced to Terry. She is surprised to hear that there's a new housemate, but at least her rent will be reduced a bit. Daphne is cross that Des didn't consult her though. Julie is still in a very good mood as she clears away the dinner dishes. HELEN: (whispering to Lucy) You still haven't told her what happened to the dress you borrowed. LUCY: But she's going to murder me! Apparently Lucy got green ink all down the front of it. Jim asks Julie how she's getting on with the new bank manager. She sings his praises and is evasive about them going out for a drink together. Jim and Helen send Lucy to go to confess to Julie about the dress. She reluctantly does so. Julie takes it rather calmly - she tells Lucy to be more careful, but lets her off otherwise. Shane is telling Des about Max sacking Terry for being a woman. Daphne is still sulking in the kitchen. When Shane hugs Terry, she sulks even more. Shane heads off, saying he'll get the rest of Terry's things tomorrow. When Terry has gone off for a shower, Shane asks Daphne why she's sulky. Daphne says she just would have liked Des to tell her before moving someone in. Des gets a bit suspicious about the prowler, but Shane says it's just some weirdo who's been hanging round. Julie is helping an old man at the counter - she is being very patient with him. Marilyn is rather shocked by Julie's new attitude and asks if she's done something with her hair. Just then, Phil calls Julie into her office. Phil tells Julie that a large problem has come off and he needs her help to sort it out. It turns out he wants her to help him choose some new blinds - he's found a unit to rent. Julie laugh and asks what the other colours are in the room. She looks through the catalogue and picks one out. Daphne has come round to have a moan to Helen about Des letting Terry move in. Helen thinks Des should have spoken to Daphne first. They chat about Terry. Daphne says she seems very nice, but a bit nervous and jumpy. Helen says she thinks Daphne is jealous - she's used to running the house the way she wants it. In some circumstances women can always be petty and bitchy, but they have to rise above it. Terry is pacing round the house, peeping out of the windows. She puts the window lock down then sits restlesslyon the sofa. She jumps when the telephone rings. Terry answers the phone and it's the wrong number. Shane is polishing the Mercedes. 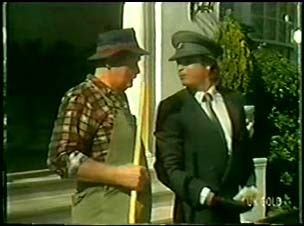 The gardener comes over to chat to him about working for Mrs Fielding. They agree she is a bit of a tyrant. The gardener has never met her husband, and he's been there a couple of months. Apparently Mrs Fielding was once her husband's secretary and married him for the money. Now she's got her hooks into his company as well - she seems to be the only one running it now. Just then, Mrs Fielding comes out and tells Shane to drie her to a private hospital. Daphne comes in and gives Terry a bit of a fright. 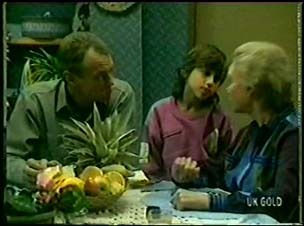 Daphne tells Terry that she's sorry for being off with her - she doesn't want her to move out. But she's over it now (apart from still being angry with Des!). Just then a car backfires outside and Terry jumps. Shane and Mrs Fielding arrive at the hospital. She tells Shane to take the rest of the day off and come back at 6.30pm. But he mustn't come into the hospital - if he does, he's fired. Des and Paul are having a cup of tea and chatting about his new tenant. Des says that Shane has already taked his claim to her. Des is coming along to a barbecue that the airline is having tonight. Lucy comes in late from school and Paul teases her that she's having an affair with a boy in school. DES: Hey Lucy. Have I ever told you that I'm going to marry you when you grow up? LUCY: Several times, but I think it would be a bit more polite to ask rather than tell. PAUL: The lady's got a point! DES: Lucy, will you marry me when you grow up? DES: Ah...well in that case, I'm just going to have to shoot myself. Shane comes round with more of Terry's stuff. Des tells him he's going out to a barbecue with some of Paul's work mates. Tery tells Shane that she's over the jitters now. Shane has got most of her stuff, and some letters as well. 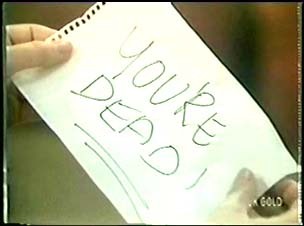 Amongst the letters is a note from her husband which reads, "YOU'RE DEAD!"